Knap Hall, a Tudor house in the Northern Cotswolds, is the secret location for the new reality TV show, Big Other. Is it haunted by its previous owner… or by the last wife of Henry VIII, Katherine Parr? Grayle Underhill, researcher for HGTV, is assigned to investigate the history of the house… and of the seven celebrities who must spend a week there under the cold eyes of the TV cameras… night after night. ‘…the characters are really very vivid – so much so that it was hard not to picture real celebrities when reading. 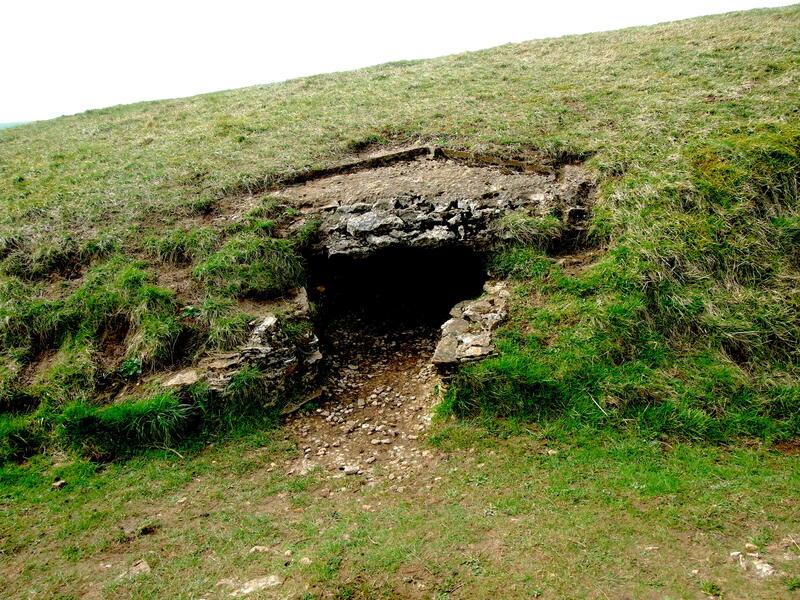 Belas Knap, a Neolithic longbarrow is close to Knap Hall. Not everyone finds it a comfortable place to be alone. 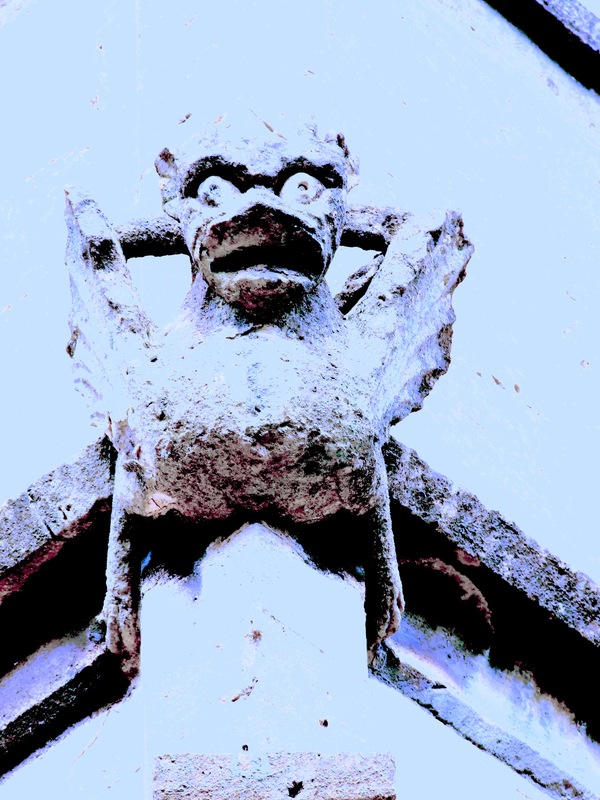 St Peter’s at nearby Winchcombe has, on its walls and tower, probably a larger collection of grotesque demonic carved faces than any church in England. Some are said to be medieval caricatures of real people. What were they for? ‘It’s a volatile mix and Rickman pulls off the difficult trick of making it all seem very real indeed. Normally any attempts to recreate the world of TV and its trappings of celebrity on the page always – to me, at least – seem doomed to failure, but characters positively leap off the page. The publishers wanted a stand-alone ghost story. Which it is. It totally stands alone, just like the earliest novels. Except they didn’t, quite, did they? Characters from previous novels floated in, although it didn’t really matter if you hadn’t read those previous novels. I became a bit superstitious about this. There always had to be someone from an earlier novel, even if it was little more than a walk-on. Anyway… Night After Night… I had the idea of a ghost story that would also be a crime story and also a novel about reality television. Essentially, I wondered what Celebrity Big Brother would be like in a supposedly haunted house. Celebrity Big Brother compressed into a week and with celebs who had either an interest in the paranormal or a profound disdain for anything unscientific. Conflict is at the core of CBB, although this would have to be slightly more cerebral, looking to take psychic research a bit further… or maybe kick it into history. My own TV experience is limited to news, so I had a lot of help from Gavin Henderson, who’s devised and produced some Big Brother. Hadn’t realised how many working people would be around that haunted house… like over a hundred? Or how much the celebs could get paid for this (a lot) or how they were chosen… or how you made sure you didn’t wind up with serious chaos and a police raid. It was big and complicated, and so it needed to be seen mainly through one pair of eyes. It looked like a job for Cindy’s friend, Grayle Underhill, American-born New Age journalist. Someone who knew how to handle slightly strange people. For some reason, I felt it needed to be told in the present tense. I’d never done this before, not for a whole book. It was interesting. It puts you right there, in the house. It makes you examine things in a more intense way. Where am I? What can I see? What do I feel? What do some people feel that others don’t? Grayle’s never entirely sure. If you’ve met Grayle before, you should know that she’s a few years older and she’s changed quite a lot. Become more British, more cynical, more objective. More interesting, I think. Right, then… a ghost story and also a crime novel, both of which kind of creep up on you. It’s about how people react to ghosts and how some people try to use them. The ghosts out there and the ghosts in your mind. How not everyone has the same experience – bit like my old website. It’s not a horror novel. Yeah, yeah, I know Amazon’s going to keep telling you it’s horror; Amazon computers don’t deal in subtleties, don’t easily handle – here comes one of my favourite words – periphery. I’ll leave you with Marcus Bacton’s view. Marcus is a grumpy old sod and no friend of Richard Dawkins. Is he right? Dunno, really.